Members of Chuǎng have been living in and travelling throughout mainland China since the late 1980s. In addition to trying to understand the dominant trends of capitalist development and struggles within mainland society as a whole, we’ve also of course been on the lookout for people who share political perspectives with our own. Over much of this timespan, the results have been sparse. We’ve met a handful of anarchists, but their interest in society has generally been limited to informal conversations, the realm of art and its attendant subcultures, and occasional acts of protest. We’ve also met a few remnants of the Cultural Revolution’s “ultra-left” who either became liberals or continue trying to justify their anti-state positions among more mainstream Maoists by citing exceptional quotations from the Great Helmsman, rather than examining the structures and struggles of the present. But in recent years, this situation has undergone a subtle change. The mainlanders from whom we’ve learned the most tend to be involved in small groups that emerged from the strike wave of 2010, when activists (mainly students and recent graduates, along with a few older leftists) from cities throughout China “discovered the new working class,” moved to sunbelt industrial districts and got jobs in factories there. Most of these activists have since moved on to the lifestyles expected of university graduates, at most occasionally participating in online discussions. Others have undertaken the “long march through the institutions,” becoming academics or social workers. Only a handful continued trying to participate directly in class struggle, investigate its changing terrain, learn about history and develop their theory in conversation with small groups they’ve maintained over the years. In the first issue of Chuǎng we shared translations from one of these groups, known by the name of their magazine: Factory Stories. Below, we translate excerpts from a series of conversations we conducted in 2017 with one member of another such group, using the moniker Lao Xie. As will become clear from the nature of our dialogue toward the end of these excerpts (as well as from our other writings), we disagree on some key points, such as Lao Xie’s prioritization of workplace struggles among certain types of wage-laborers over other proletarian struggles, or his belief that such struggles will eventually coalesce into something resembling the historical workers’ movement—or that such a movement would be necessary and sufficient to usher in a communist revolution. On the other hand, we find his observations about developments in China since around 2012 to be among the most sophisticated and thought-provoking we’ve encountered. The group at the core of China’s ruling class has clearly expressed its intention to continue monopolizing state power into the foreseeable future, determining that its contradictions with other fractions of the class cannot be smoothly worked out through the principles of “political pluralism.” At the same time, this group is actively attempting to learn from the old capitalist world. And like the rest of that world, China is entering a period of retreat from “globalization.” International interests are being reorganized. All these factors are generating multiple levels of internal tensions across Chinese society. Society has not yet settled into a condition where everything follows rules that people regard as natural and unassailable. I think this is the reason that China has a special, perhaps unique value for the class struggle. If it were just a matter of the number of workers or strikes, then India, Indonesia or Vietnam might be more important, but no other country has quite this combination of factors at play as we see in China today. 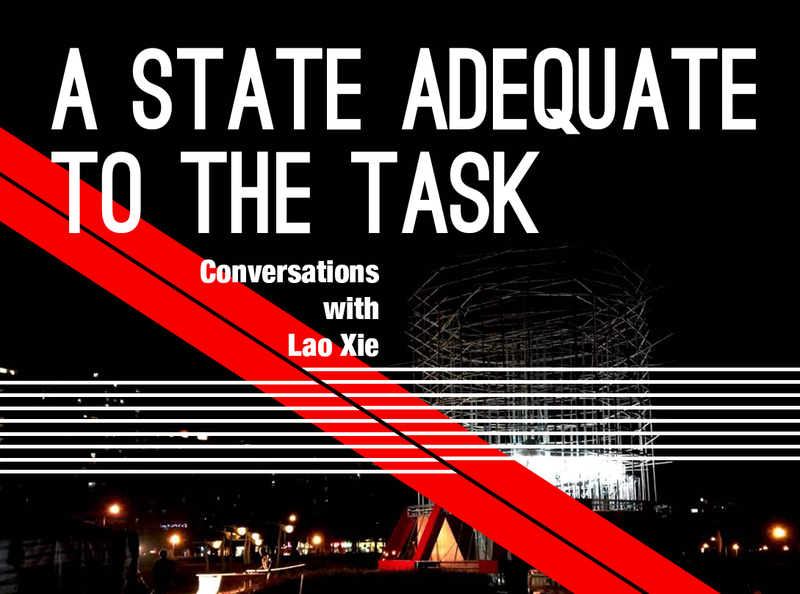 This initial conversation, focused on the various political tendencies active in contemporary China, functions as a background to the more in-depth interviews below about the structure of Chinese society and the political changes since 2012. It started partly in response to our question about Wang Jiangsong, a self-described “social democrat” academic beloved by certain labor NGOs and their funders. Wang often gives lectures warning against the risk of “ultra-leftist” influences on Chinese workers, fearing such radical elements in labor circles will lead China’s “labor movement” onto a path of destruction and chaos. It is thus the duty of labor NGOs, Wang argues, to direct workers onto a peaceful path toward social democracy via collective bargaining and the formation of moderate unions. 闯: How influential is Wang Jiangsong? [A friend] is worried that he’s exercising a pernicious influence in labor circles. Lao Xie: (Laughs) Wang and a few of his followers think they’re really important, but they have very little influence anywhere, even in China’s already miniscule labor circles. If you want to understand bourgeois ideology in China, you should focus instead on those groups with the ability to put their ideas into practice. Those consist mainly of more successful capitalists and their intellectual affiliates. 闯: You’ve said that an important point of contention is between those inside the [party-state] establishment (体制内) and those outside it. My understanding is that those inside it basically support the CCP while those outside tend to be liberals, advocating some form of multi-party democracy that would allow them greater representation in the state? LX: That’s one way of putting it, but maybe too simplified. Actually all of China’s successful capitalists are to some extent “inside the establishment” – through either kinship or relationships they’ve cultivated with officials. It’s just a matter of degree, and that roughly corresponds to their amount of wealth. The better one’s connections in the establishment, the easier it is to succeed in business. 1) Reformism: those who defend the existing system but call for some degree of adjustment. They support CCP rule but wish they had more freedom, e.g. for lawyers. This perspective corresponds mainly to the wealthiest tier of private capitalists, those at the helms of companies worth at least a trillion yuan [155 billion USD]. 2) Those who want to destroy the system. They demand more thorough change because the system seems to be preventing them from getting richer. Among these, there are a variety of political programs, but the main point is that the CCP would have to step down. These are mainly the small and mid-scale capitalists. 1) Liberalism, which here means to split the CCP into multiple factions or parties and then have elections according to one of various models. This is the more common position. 闯: What about those who advocate the formation of new parties unrelated to the CCP, or who support one of the underground pro-democracy parties? LX: No one with any influence to speak of advocates the formation of new parties with no connection to the CCP. The underground democracy parties are smaller than ants, with no independent strength. 2) Conservatism, meaning the revival of traditional culture: increasing men’s rights over women, outlawing divorce, legalizing domestic violence and filicide, establishing a stricter hierarchy in society – for example requiring students of lower grades to bow to those of higher grades, as in Japan and Korea a few decades ago. Reviving something like China’s traditional caste system: if you’re a peasant then your children can only ever be peasants. An extreme position in this spectrum is advocating the restoration of monarchy. In a broad sense, such conservatism includes Bo Xilai, who was a “celebrity politician” like Modi or Trump, using personal charisma. Although Bo mobilized popular support around the claim to be restoring socialism, actually he is better understood as a right-wing conservative. Of course there’s some overlap between these two sets of positions. 闯: How are these oppositional bourgeois political ideas being articulated? How do you know about them? LX: The bourgeoisie is becoming increasingly organized. They have social clubs and business associations that sometimes display political features. For example the Taishan Club (泰山会) is a small club of major figures in industrial-commercial circles. Zhenghe Island (正和岛) is another one. A researcher at the Chinese Academy of Social Sciences published an article about these organizations. These organizations aren’t exactly outside the establishment. They’re like “white gloves” (白色手套): representing establishment interests outside of the establishment, but also with their own independent interests. 闯: But you say these aren’t parties exactly, and none of the underground parties are important – neither the democracy parties nor the left-leaning ones, such as the pro-Bo Xilai “Constitutionalist Party”? LX: Those parties are just independent projects by small groups of people without any social basis, and they don’t represent any particular class interests. They’re marginal. 闯: What about the proletariat then? LX: The proletariat has no organizations of its own. 闯: What about hometown associations (同乡会)? LX: Nowadays hometown associations mainly serve the interests of small-scale capitalists and intermediate strata. They have no connection to traditional hometown associations, which sometimes did actually serve the interests of poor migrants. 闯: Setting aside the question of class organization(s) for now, what are China’s main left-leaning political perspectives nowadays? 1) People with connections inside the establishment. These are what’s known as “the old left.” Many are former or active low-level officials or academics. 2) People outside the establishment, who are mainly college graduates with white-collar jobs working for companies. b) those who focus on “mass work” or “cultural work,” including activism among workers, but also among students and peasants. 闯: Among those, how many are Maoists and how many have other coherent perspectives? Most of the Chinese leftists I know don’t seem to have very coherent perspectives, but many seem to have some kind of vague admiration for Mao or nostalgia for the Mao era. LX: Probably at least 99% of leftists in China are Maoists, and this includes all of these categories I’ve mentioned. There are many types of Maoists, but the main division is between left and right. 闯: Some Maoists identify as “right-wing”? LX: They would probably identify as “left,” if anything, but objectively they’re on the right – just like Bo Xilai. In fact, many of them were fans of Bo Xilai. Later most of these became supporters of Chairman Xi [Jinping]. Right-wing Maoism seems to be a phenomenon unique to China, but it’s extremely common here: the combination of Maoism and capitalism, using Maoism to develop capitalism. Basically this means a form of nationalism. 闯: What about Trotskyists, anarchists, left-wing social democrats…? LX: (Laughs) Probably about one in 10,000 leftists in China are Trotskyists, if that many. But at least Trotskyism has taken root. Anarchism has not. Anarchists in China are mainly just cultural liberals. Very few of them are interested in society. They’re too marginal to include on the political map of today’s China. The same could be said for so-called “social democrats”—whether on the right, such as Wang Jiangsong, or on the left, such as some of the “New Left” academics. 闯: But it seems like quite a few influential intellectuals publicly identify as social democrats. Surely that counts for something? LX: Social democracy rejects revolution in favor of reform. It’s incapable of influencing Chinese society, because the condition of social thought in China (中国社会思想状态) cannot accept any reform from the bottom up. One of the tools used by Bo Xilai was reform. That was an example of top-down reform, but there’s no support for bottom-up reform. Post-socialist countries all have a common problem of individualism and low public-mindedness (公共意识). To be a “moderate socialist” in today’s China essentially means to defend capitalism while advocating some minor reforms, such as improving welfare for the poor. “Social democracy” is associated with Scandinavia, which sounds good to both the left and the right as an imaginary for xiaoshimin [lower-middle strata urbanites]. Such social democrats are not even reformists, because to be a reformist you need to be an activist and have a social movement to support your position. For example, many of these social democrats advocate controls on housing prices and rent, but they don’t have any power to implement such proposals. 闯: How about in labor activist circles? LX: In labor circles, most people with a political perspective are left-wing social democrats, likewise pointing to Scandinavia as a model. Most labor NGO staff don’t have any coherent political perspective at all – it’s just a job for them, and at most a way to feel good about helping the downtrodden, but they take the system for granted and don’t advocate any kind of systemic social or political change. Almost all NGOs based in Hong Kong, on the other hand, have political positions, and they’re almost all left-leaning. But often these positions are mere performances used for professional purposes. Most of their staff don’t really believe in the positions they present to the public. Political performance is just part of their job. Many of these NGOs’ directors became politicized in Hong Kong’s youth radicalization movement of the 1970s. At that time, they believed in their politics, but now it’s just a show, a business model. For example, in order to get money from funders and to get support from the international media, from the European left – not only money but also spiritual support…. LX: (Laughs) We’re the best, of course! We’re pro-revolutionary (主张革命的). We don’t say “revolutionary” because that would be exaggerating—there’s no revolution for us to be part of. We’re not typical leftists. We don’t like debating programmes. We don’t yet have a clear programmatic sense of belonging (归宿感). We’ve been focusing on labor-related activities (工人工作) for many years now. If we were leftists we would have fallen apart long ago because of internal debates—that’s why we can work together. 闯: What is your critique of the other pro-revolutionary left-wing perspectives you mentioned, other than the fact that they tend to get bogged down in debate? LX: The biggest problem with Maoists is that they’ve given up on class struggle. Even the pro-revolutionary left-wing Maoists have given up on class struggle. Lenin said, “A person who recognizes the necessity of class struggle but not the necessity of revolution cannot be called a socialist.” But today’s Chinese Maoists are even worse: they’re not mature enough to be clear about who they are and what they want. What they call “revolution” is just abstract radicalism. I’m worried that there might be seedlings of fascism in this sort of radicalism. I heard that in Russia, some people who were Stalinists and Trotskyists in the 1990s have ended up becoming fascists over the past few years. And I see that possibility here among some of these Maoists, but not yet. LX: In most countries, the historical thread of private property was never broken, nor the thread of resistance against the bourgeoisie, so there has been a living logic that is inspired by the history of rebellion. In China, that thread was broken. You have to be aware of this if you want to understand the Chinese Left. For instance, Chinese people are still in the process of relearning what “class” means after the strange things that term came to be associated with during the Mao era. It might take another twenty years for people to relearn what it really means through their own experiences of class struggle in the market economy…. The most basic characteristic of today’s Maoists is defense of the existent (维护现状). 闯: How could that be? Aren’t many of them calling for something like a return to how things were during the Mao era? LX: Yes, but I mean their spiritual condition (精神状态) is one of inertia (惯性) rather than of subversion. It’s essentially conservative. In Chinese political discourse this is associated with the term “constructive” (建设). Their emergence derived from the destruction of what existed before, and they aim to restore what’s been destroyed—that’s why I say they’re conservative. This contrasts with us, who emerge from present conditions, aiming to destroy them and create something new. Their attitude toward mass rebellion and even towards the masses themselves—especially toward workers—is one of contempt and fear. This derives from the experience and habits of CCP bureaucrats. It is the attitude of xiaoshimin in a tranquil society toward the destructiveness associated with workers’ actions. 闯: When and how did this new Maoist Left take shape? There were a few landmark events, such as the productions of the play Che Guevara (切·格瓦拉) in Beijing and other cities [starting in 2000]. That played an important organizational role. 闯: You mean the play by Huang Jisu? LX: Yes, but I don’t want to give him too much credit. A lot of other people were involved. Not only leftist intellectuals like him but also many ordinary people who were discontent with capitalism, such as students, workers and old CCP members. Only a minority of intellectuals were involved in such leftist activities at that point. Another landmark event was a Maoist Left conference in Zhengzhou with over a thousand participants. That was [some time around the turn of the millennium]. Already at this time, a debate emerged about whether and how to participate in politics—by forming a new party or by working through the existing system. This quickly led to splits until the movement dissolved into multiple little circles. So its zenith was right at the beginning, and it hasn’t recovered since. Some of the best people left, including some workers who had called for direct action and felt frustrated with all the empty talk. No direction was found that could unite the majority of opinions. Then, around the time China entered the WTO in 2001, the nation entered a period of industrial prosperity. This transformed the whole atmosphere from a widespread sense of crisis to one of political tranquility. Or maybe you should say, everyone became distracted by the prospect of getting rich through new business opportunities. Most people with a university education got high-paying jobs at companies, forming the core of a new middle class, and they lost interest in political questions. It was at this time that the Maoists’ conservative characteristics became more pronounced. For many years, all they did was what they called “cultural work.” You know what that means: basically just singing praises to Mao and the glories of his era, the glories of China, the glories of labor. Maoist intellectuals and students and a few retired SOE workers and party members did this among themselves in public parks. Some went to the countryside and the new industrial zones to do this together with peasants and new workers, but still it was basically just self-entertainment (自娱自乐). Some of them launched a campaign petitioning the government to turn Mao’s birthday into a national holiday. This was the sort of thing they considered important. Meanwhile, China’s class structure was changing. The new working class was emerging through struggles in places like the Pearl River Delta (PRD). Various political groups, including some of the Maoists, tried to take advantage of this new social force and win it over to their respective causes. The Maoists have failed to truly influence the workers because of that conservatism I mentioned. That has prevented them from helping the workers to fight and increase their power. But to say they’ve failed implies that they have the same goals as us, which I don’t think is really true…. 闯: Before we get to the present, let’s clarify your perspective on the past. How would you characterize China’s social formation in the 1960s? Did it have a ruling class? Lao Xie: I basically agree with certain Trotskyist accounts of this history. By the late 1950s, the previous ruling classes had been basically exterminated—socially and in many cases physically. The party-state bureaucracy (党政官僚) never formed a ruling class in the strict sense, but it was a group with special privileges (特权). It effectively controlled the means of production. And as time passed these bureaucrats became increasingly aware of their collective interests. You could say it wasn’t a “class-for-itself” (自为的阶级) but a “group-for-itself” (自为的群体). By the 1970s, after the turmoil of the Cultural Revolution, this group increasingly desired to consolidate its power and become a ruling class. In the context of global capitalism, that could only mean that it had to become a bourgeoisie. 闯: How about the social formation? Was there a distinct mode of production? Was it a form of capitalism? LX: I disagree with the theorists who say it was a form of capitalism. It functioned differently. For example, development was driven by state planning rather than by private interests or the profit motive. I’m not sure if there was a coherent mode of production operating, though. It was always very unstable. 闯: Our article [“Sorghum & Steel”] argues that “the socialist developmental regime” from about 1956 to the 1980s wasn’t a mode of production as such because it didn’t have a single internal logic or a way to reproduce itself, so it relied on state efforts to hold different sections of the economy together, each of which operated according to different logics. Does that make sense? LX: In the past I would have told you my theory about this, but nowadays I’m hesitant to make such grand statements…. 闯: When did the transition to capitalism begin and end, and how did the new bourgeoisie form? LX: The earliest steps began in the early 1970s, after the conflict with the USSR. There was Kissinger’s secret visit in 1971 and then Nixon’s official visit in 1972. But more important were the children of high-ranking officials who went to university in the US. The real purpose of their visit was to learn more about the capitalist system and consider whether to adopt elements from it. They also played an important role in building ties between China and the US, and to the capitalist world as a whole. But of course the actual transition didn’t begin until the 1980s. I disagree with the idea that it was all because of Deng Xiaoping, or that he consciously wanted to restore capitalism. He was just responding to deeper concerns among the bureaucracy as a whole to consolidate its power and benefit materially in the face of its crisis in the 1970s. In the context of global capitalism, adopting market reforms and using state power to go into business was the most obvious way to do that. The transition to capitalism was completed in the late 1990s, along with the bureaucracy’s transformation into a bourgeoisie. This completion was marked by two developments: the restructuring of state-owned enterprises (SOEs), and the bourgeoisification (资产阶级化) of the entire bureaucracy down to the lowest levels. At first, in the 1980s, it was mainly just the higher-ranking officials who went into business, but by the late 1990s, even the lowest levels had also become capitalists. 闯: So the entire bureaucracy turned into a bourgeoisie? There were no bureaucrats who didn’t become capitalists? LX: Yes, if we limit the term “bureaucracy” to those state officials with any degree of real power—those in charge of some state office, from the head of a ministry down to the mayor or party secretary of a township. All of them became bourgeois in the literal sense of becoming capitalists, of running businesses for profit. Of course, it’s usually not the bureaucrats themselves who own businesses, since that’s illegal in China, but they run them through their relatives and cronies. But not all capitalists are officials, of course. In fact most are not. To put it more precisely: the first new batch of big capitalists became capitalists through their access to state power, but eventually many other entrepreneurs obtained wealth without much direct access to state power. China’s richest capitalists all have some deep connections to state power, but many of the others do not. And that’s an important source of tension within China’s bourgeoisie. Some of Chairman Xi’s policies can be understood as a response to this tension. 闯: Some people say that China has two overlapping but distinct ruling classes, each with its own interests: a party-state bureaucracy and a bourgeoisie. Do you agree with that? LX: No. China has only one ruling class: the bourgeoisie. There are no state bureaucrats who aren’t also capitalists. Some people may be confused about the term guanliao (bureaucracy or officialdom). It doesn’t include civil servants (公务员), who don’t have any real political power, just a stable job and some prestige. The lowest level of the state bureaucracy is kezhang (科长), the head of the lowest level of a state ministry. State employees below that level are not bureaucrats in this sense but merely civil servants. And I think it would be impossible to find any kezhang or higher-level bureaucrat who doesn’t run a business. This seems to be different from some other countries, where bureaucrats are merely state employees with a little more power than civil servants. In China bureaucrats control the means of production, and they use these for either private or public for-profit enterprise, so they’re capitalists. 闯: If the transition to capitalism and the formation of the new bourgeoisie was already completed by the late 1990s, then what has changed since 2012? LX: From 1976 all the way up until 2012, you could say that the Chinese government was merely a provisional (临时) government. It really was “crossing the river by feeling the stones” [as Deng Xiaoping said]. It didn’t have a coherent long-term strategy. When the transition to capitalism generated problems, leaders basically dealt with them one at a time. When Chairman Xi came to power, his government finally put the long-term interests of capitalist accumulation on the agenda. As with Deng, it’s important to avoid attributing too much agency to Xi alone. He didn’t fall from heaven, but is merely a manifestation of the Chinese bourgeoisie’s deep-seated desires. This isn’t a matter of a few individuals but something propelled by the common interests of the ruling class as a whole. 闯: In a previous conversation you mentioned that these changes actually started before 2012, for example with the local policy experiments of Bo Xilai and Qiu He which the Xi regime later adopted while throwing their authors into prison. Were these the earliest manifestations of the coming changes? LX: First of all, it’s important to distinguish between Bo Xilai and Qiu He. Qiu was merely a pawn on the chessboard (小卒), whereas Bo attempted to be the hand that moves the pawns (棋手). Qiu’s experiments [in Suqian and Kunming] were more technical and specific to the locale, whereas Bo’s experiments were attempts to articulate an entire new national strategy. Meanwhile, at the central level, Hu Jintao’s government also began some initiatives that later became central to Xi’s strategy. For example it was Hu’s regime that began expanding China’s presence in the South China Sea. 闯: What exactly did Qiu He and Bo Xilai do? Which of their initiatives were adopted by the Xi regime, which were rejected, and why? LX: Qiu He has been called “China’s Pinochet,” since his experiments included neoliberal reforms. For example he sold off local schools, hospitals and SOEs to private investors. But that was about the extent of his neoliberalism. His other reforms were similar to those of Bo Xilai, just on a smaller scale. For example he tried to increase administrative efficiency through top-down pressure on state employees, including selective crackdowns on corruption. He also invested state funding heavily into the improvement of basic infrastructure—roads, water, electricity, etc. This differed somewhat from Bo’s infrastructure projects in that Qiu’s projects were focused exclusively on attracting private investors, which he successfully did, to some extent: a few companies came and opened factories in Kunming while Qiu was in office. Bo’s experiments in Chongqing were similar to Qiu’s in their focus on increasing administrative efficiency, selectively cracking down on corruption, improving infrastructure, and attracting private investors. But this was all done on a much grander scale, not only because Chongqing is a provincial-level municipality, but also because Bo was allied with Chen Yuan, son of Chen Yun and head of the China Development Bank, so he had a basically unlimited line of credit for large-scale loans. Another major difference from Qiu’s experiments was that Bo actively sought out popular support, including the support of low-level civil servants. 闯: Sure, you’ve said that instead of thinking of him as a leftist social democrat, it’s more accurate to think of him as a conservative populist along the lines of Modi in India. LX: Actually I don’t like the term “populism” (民粹主义) because, in Chinese anyways, it can be misleading, and it obscures important differences among various so-called populist strategies. Let’s just say Bo was a political speculator (投机者). 闯: With his “red culture” campaign, for example? LX: That too has been over-emphasized by the media. The main reason people supported Bo was a series of measures that he took with concrete effects on people’s lives: cracking down on street crime, ending the influence of heishehui [criminal syndicates or gangs] on the economy and their collusion with basic-level administration, uprooting local government’s sources of power other than himself. Previously the collusion between gangs and local officials had constituted a separate underground government. Actually the heishehui in Chongqing hadn’t been particularly big compared with those in other cities. At the time, the central government sent someone to investigate, and Wang Lijun [the police chief of Chongqing] pointed that out. Bo’s crackdown on organized crime caused such an uproar not because of the scale, but because it violated what had been the universal norm of government collusion…. The goal of the crackdown was to increase administrative efficiency by cutting down on corruption and increasing discipline. Another goal was to increase control over the local bourgeoisie. An important part of the relationship between gangs and the bourgeoisie is in the area of money-lending and extortion. The Xi regime hasn’t directly adopted this experience of cracking down on heishehui, since that would be hard to do on a national scale, and it’s not necessary: the main aspect of organized crime that concerns Xi is its role in [government] corruption, in administrative efficiency, so that’s what he’s focused on instead. The main difference between Bo Xilai and Qiu He was that Bo concretely benefitted the common people of Chongqing. Besides cracking down on organized crime, the increase of administrative efficiency benefitted not only investors but also ordinary people. This point is important. The people of Kunming did not feel such effects from Qiu’s reforms. In Chongqing, on the other hand, it became much easier for common people to have all sorts of problems solved quickly just by going to the government and asking for help. Then there was Bo’s public housing policy…. But the other side of Bo’s housing experiment was the privatization of land, where the government took ruralites’ land in exchange for “land tickets” (地票) and forced them into high-rise apartments. I haven’t heard of any collective resistance to this, but it was the only sphere where the Chongqing Model promoted privatization. In contrast with Qiu He, Bo didn’t privatize schools, hospitals or SOEs. 闯: So which aspects of these two experiments did the central government adopt? LX: All of these policies I’ve just listed were adopted except, on the one hand, the central leaders abandoned Qiu He’s strategy of complete marketization, while on the other, they also rejected Bo’s strategy of trying to placate the masses through measures such as building public housing. Indeed, Chairman Xi’s policy has been to actually prop up housing prices. But more generally, the state could simply not afford such spending to placate the poor on a nationwide scale. Bo was able to do that because it was just one city and he had an unlimited line of credit. Finally, the Xi regime also hasn’t imitated Bo’s crackdown on organized crime as such, again because it would be hard to do that on a nationwide scale, but also because the relevant aspects of that crackdown are already included in Xi’s anti-corruption campaign. Of course, the Xi regime is trying to do much more than just adopt lessons from those experiments in Chongqing and Kunming. One of the main things the regime has been trying to do is to rectify and consolidate (整顿) the party-state apparatus. Bo and Qiu had also tried to do this on a smaller scale, but mainly with regard to administrative efficiency. The Xi regime has already gone much farther in this regard, and it has put a lot of effort on trying to transform the state’s ideological apparatus. It’s trying create an ideological system capable of justifying the long-term existence of capitalism in China. The emphasis has been on digging through traditional Chinese thought and reviving ideas such as ge an qi wei (各安其位): everyone should accept their fate and take it as a moral obligation to play the role they’re assigned in a hierarchy. Women should obey men, children should obey their parents, workers should obey their bosses, etc. As for the regime’s economic strategy, this has two main aspects. One is the assertion of more direct control over the central SOEs, opposing those in the party who have advocated privatizing them and instead reaffirming their role as the central state’s most important source of income. The current campaign to reduce excess capacity in the steel and coal sectors needs to be understood as part of this broader strategy. The second is the localization (本土化) and upgrading of manufacturing: moving from the mere supply of products for foreign companies to the development of Chinese brands, doing our own research and development, and moving up the industrial chain to higher value production. 闯: How do you interpret the Xi regime’s political repression beyond the sphere of party-state rectification, such as the crackdown on civil society? LX: Chinese capitalism seems to be in a preliminary stage of democratization. It is no longer possible for the CCP leadership to ignore the other bourgeois interest groups active in Chinese society, such as lawyers, the cultural sector, the religious sector, and [ordinary mid-scale] private bosses [without effective connections inside the party-state establishment]. LX: They’re not significant enough to constitute a distinct interest group. They’re basically part of the Chinese and foreign bourgeois cultural apparatus. One proposal that was popular for a while was to allow these interest groups to interact directly with the masses and then obtain a share of state power through electoral politics. For example in 2011, the Wukan Village Incident was widely exploited by the media and mainstream academics linked to the private bourgeoisie in order to advance this agenda. That was also around the time when private capitalists were increasing their efforts to link up with one another (串联), forming organizations such as Zhenghe Island. Something to understand about private capitalists is that, within the same individual, they embody both the independent interests of a private entrepreneur and the desire to control or influence establishment interests derived from state power. For each type of interest there is a different way that power is expressed. Their interests as private entrepreneurs make them more inclined to seek out legalized affirmation by voters through elections, whereas their interests within the establishment make them more inclined to seek out affirmation of their status by a higher level of the state. And what those representations of Wukan emphasized was that power could achieve legal affirmation through elections. Since Xi came to power, however, things have changed. The regime has more clearly affirmed the interests of various factions of the bourgeoisie, trying to convince them that their interests can be secured through top-down arrangements and cooperation. At the same time, it has closed off the path of achieving a share of state power through popular elections. The regime is trying to convince even the biggest private companies that the only way to secure their interests is through long-term cooperation in which the state continues to play the dominant role. The private bourgeoisie is already fully mature, and it has been advocating electoral politics for many years. So this effort on the part of the central government to co-opt them is still far from complete. The two sides are locked in a sort of tug-of-war. And it wouldn’t be sufficient for the regime to merely dominate the private bourgeoisie in a repressive manner. Instead it hopes to devise more sophisticated methods to secure their interests, to establish a long-lasting “republic” (共和) of the propertied, with institutions for facilitating consultation among different fractions of the ruling class. In this, however, the key is still that the CCP must maintain its dominant position and get the biggest slice of the pie. Not only is this project of the Xi regime to co-opt such interest groups far from complete, but in each of these groups there are strong and widespread voices of opposition. 闯: What sorts of political programs are articulated in these voices of opposition? Are they mainly liberal, calling for electoral democracy as you mentioned before? LX: Nowadays fewer and fewer mainstream intellectuals are willing to call themselves “liberals.” Instead it’s become more popular to call oneself a “conservative.” I think this is part of a global trend, but it’s become especially pronounced in China. For example in their discussions about Wukan, although intellectuals praised the villagers’ goal and practice of electoral politics, some of them harshly criticized the villagers’ use of so-called “insurrectionary tactics” (暴民政治) in order to obtain the right to hold such elections. The main expression of such conservatism is the elevation of property rights over other rights, of the freedom of property over any other freedom. Such voices existed before, but now they’re more prominent. For example, Chinese liberals have been reading Hayek for years, but only recently have they developed a deeper understanding. Now intellectuals tend to emphasize the primacy of developing a sociopolitical order and stability capable of protecting private property at the expense of other freedoms. Even people within the establishment are worried that their private property is not secure enough. So this desire for order is something shared by the bourgeoisie as a whole. But private capitalists also want more political power, so in addition to order, they also often sing praises to freedom and democracy. It’s basically impossible for us to know details about political programs popular among private capitalists as such, but by proxy we can look at those discussed in the media and among intellectuals, who often operate in collusion with such capitalists, or are close to them personally. Recently, their programs can be roughly divided into two categories: the majority who advocate electoral democracy, and the growing minority of more extreme conservatives who are pessimistic about elections, instead advocating a collegiate system (合议制) for negotiating interests among the various propertied groups. One model they point to is the system of “functional constituencies” in Hong Kong’s Legislative Council. Many regard Hong Kong as China’s most important political laboratory, in more ways than one. 闯: In previous conversations you’ve also mentioned other aspects of conservatism among China’s private bourgeoisie, such as the resurgence of interest in Confucianism and even calls to restore the monarchy. How influential are such perspectives? LX: Well monarchism seems to be pretty rare, but Confucianism is extremely widespread, and not just among the private bourgeoisie. If anything it was the CCP that initiated the revival of Confucianism in mainland China. Although the Xi regime has gone further in incorporating this into the CCP’s propaganda videos, posters, etc., this goes back at least to the era of Jiang Zemin in the 1990s. Already at that time, the state began inviting ideologues of New Confucianism such as Tu Weiming to serve as high-level advisors. 闯: Despite these commonalities across different sections of the ruling class, such as growing conservatism, you’ve mentioned widespread opposition to the Xi regime among major fractions of the private bourgeoisie, and a growing tension between those capitalists inside and those outside of the party-state apparatus. For example, just a few months ago [March 2017], the Minster of Supervision publicly warned that “some entrepreneurs hope that after obtaining economic power they can then go on to win political power; this is extremely dangerous.” How might this tension play out over the next few years? LX: First of all, it’s not only people outside the establishment who are discontent with the Xi regime. Of course there are rival factions within the CCP, but even many bureaucrats who haven’t been directly attacked seem rather uneasy about how extreme his measures have been and how rapidly they’ve been carried out. He has also offended those who supported Hu Jintao’s policies. For example, someone in the Xi administration recently said that the previous regime “made some unrealistic promises” about Social Insurance…. The reason he’s offended many people with vested interests is that the preceding period of “provisional government” [from 1978 until 2012] saw the formation of some deep-seated habits for survival, rules of the game and conflicts of interest among the top layers of society, and Xi is trying to smash all of these. His reforms have struck a nerve among the majority of China’s rulers with regard to their interests. The entire class is watching eagerly to see what will happen next. This state of uncertainty and these tensions between sections of the ruling class represent an opportunity for workers. However, if the reforms succeed in “making China great again” (让中国再次伟大起来 [Chinese translation of Trump’s slogan]), in turning China into a superpower, even many of China’s subordinate populations (被统治者) may get to enjoy a small share of the profit generated from imperialism. If so, then this opportunity may be lost. 闯: Could you clarify which classes and interest groups exist in China today? Who are the rulers and who are the ruled? LX: An important thing to emphasize here is that all of China’s rulers already carry out exploitation through the capitalist mode of production, rather than through non-economic means. On the surface it may often appear to take the form of raw, direct expropriation, but on a fundamental level, it is through trade on the capitalist market and through the exploitation of labor-power that these rulers acquire their wealth. 闯: Speaking of “new capitalists,” the last time we talked, you often used the term “private bosses.” Does this mean private bosses outside the establishment? Because a lot of state bureaucrats also run private enterprises through their families, right? LX: Actually the more important difference is between private capital and state-owned capital. Even if a private boss is, for example, a mayor or a provincial party secretary whose son or daughter owns a private enterprise, that family still functions as a relatively independent proprietor with private interests of its own. But state-owned capital functions differently. It’s more integrated. 闯: So if we’re going to classify the rulers into different groups, they can be divided according to their control over private capital vs. state-owned capital? LX: I wouldn’t write that as a theory, but as a rough heuristic device. Actually there’s a lot of overlap between these two categories. 闯: Then what are the differences between the two and how do they relate to one another? You say state-owned capital is more integrated? LX: Yes, roughly speaking, it constitutes a community of interest, an organic whole. Private capital, on the other hand, regardless of how close a relationship it has with state bureaucrats, or even if an enterprise is directly owned by bureaucrat’s family, its interests are independent from those of other private enterprises. 闯: So among private enterprises, it doesn’t make much of a difference whether the boss is inside the establishment or outside of it? LX: Correct, it really doesn’t make much of difference. Especially when it comes to enterprises with any real wealth to speak of, they nearly always have close relationships with specific state officials. 闯: But last time you said there was a contradiction between capitalists inside and outside of the establishment, with the latter seeking to increase their political power, so there seem to be two levels of analysis: a contradiction between bosses inside and outside of the establishment, and a contradiction between state-owned capital and private capital? LX: Yes, you could say that. Even if a private enterprise is owned by the family of a high-ranking bureaucrat, it’s still at a disadvantage relative to state-owned capital. 闯: Then what is the relationship between these two contradictions? Could we say one is on the economic level and the other on the political? LX: Competition (争夺) for state power can be divided into at least two aspects (点). The real owners of state-owned capital cannot be understood as simply “within the establishment.” It’s an extremely small group of people who actually control it. Especially over the past five years, Chairman Xi has opened up everyone’s eyes about this. The overwhelming majority of people in the establishment, even the heads of provinces and the central ministries, are merely the servants (家奴) of this smaller inner circle. 闯: I thought the heads of ministries were the main people who controlled state-owned capital. LX: Nope. You know those butlers that European aristocrats used to have on their manors? Ministers are like butlers. What can butlers do? They can take advantage of their position to pilfer a few things here and there, embezzle, you know, but they’re far from the real masters of the house. Or you could liken them to the managers of capitalist enterprises in America, for example, where the traditional great families, like the Rockefellers, long ago retreated from the frontlines of production. Now they’ve hired professional managers to deal with that. Although those managers receive high salaries, they’re not the true bosses. But actually China’s ministers are not nearly as free as the managers working for the Rockefellers. For example, if the Rockefellers discover you’ve been embezzling, they can’t just throw you in prison for eighteen years. 闯: Then who are the real bosses of state-owned capital in China? Zhongnanhai? LX: Not entirely. Zhongnanhai refers mainly to the current Standing Committee of the Politburo, but most of the people with real power have already retired, and some never even served as officials in the establishment. For example there’s a man named Song Ping, a former member of the Standing Committee. He just turned one hundred years old, but he’s still an important member of this inner circle. 闯: About how many people are in this inner circle? LX: (Laughs) No clue! Definitely more than Zhongnanhai, because Jiang Zemin also left Zhongnanhai long ago, for example. But much smaller than the Central Committee of the CCP. And it’s not as if the two overlap. Almost all the members of the Central Committee are just servants. The real bosses aren’t in the Central Committee. 闯: How do they exercise control? LX: Of course this is a secret only the rulers could know in detail, but observing from the outside, there are at least two ways. One is through clientelism, as an elder (长老) controls a group of people through personal loyalties, in this case through the workings of the state, but similarly ensuring those loyalties by intertwining their interests with his own, and in this way exercising control over state-owned capital. The second way is through family. The latter has more of a legal basis, the former is less formal…. 闯: So the ruling class can be divided into at least two main fractions: this inner circle who control state-owned capital, on the one hand, and the bosses of private enterprises, on the other. LX: But the bosses of private enterprises, such as Jack Ma, are often significantly influenced by the bosses (laughs)—and essentially they are bosses—of state-owned capital. If Jack Ma had no support from the highest levels of the establishment, there’s no way his business could have grown as big as it has. So it’s not as if there’s a clear line between private and state-owned capital, as if your property is yours and mine is mine…. 闯: How do you know all of this? 闯: Isn’t Gou from abroad in the first place? LX: That’s just where he came from. It was in mainland China that he got rich, in Taiwan he was nothing. He never even opened a factory in Taiwan. But it’s not clear who his backers are. The point is that in China, it’s impossible to “pull yourself up by own bootstraps” (白手起家). I imagine that’s true all over the world. If your business succeeds beyond a certain point, that means you have the support of some powerful capitalist backers…. 闯: What you’ve described sounds the opposite of America. There state bureaucrats are the servants of private capitalists. LX: That’s true. Capitalist development in China is upside down. It’s always been that way, ever since the Republican era…. 闯: I’m confused now. At first you said there was a contradiction between private and state-owned capital, but then you said that the two are intertwined and ultimately controlled by the same inner circle. LX: Well private capital also includes a large number of small and medium-scale capitalists, and many of them actually are at quite a distance from the establishment, but this doesn’t necessarily mean that they’re opposed to it, just that they haven’t managed to curry favor. 闯: But is it accurate to say that the true owners of private capital are the same people who control state-owned capital? LX: As you know, at this point in the development of capitalism, it’s impossible to say who are the true bosses of especially large firms, but I think China is different: control really is concentrated in the hands of a few specific individuals. That isn’t to say that a private capitalist like Wang Jianlin is merely a manager. For his business to grow as big as it has, of course he’s got to enjoy a piece of the pie. Moreover, one of the traits of contemporary capitalism is that even managers often possess a great deal of power—that’s especially clear in the West. They can basically allocate capital as they see fit and then justify it to the board of directors with a few reports. And the same is basically true in China: managers act like bosses, until periodically they come into conflict with the real bosses…. 闯: So the contradiction you discussed last time, between bosses inside and outside of the establishment, is essentially a contradiction between smaller-scale capitalists and the establishment itself—not that they’re opposed to the establishment, but they want more access to state power and the resources they hope that would bring? LX: You could say that. 闯: What about those other interest groups you mentioned. Are they attached to this group of smaller-scale capitalists outside the establishment? LX: No, that’s too muddled. It would be better to say there are three groups—and keep in mind this is just a rough outline: First is the inner circle, as you said, who both control state-owned capital and have a major influence on large-scale private capital. Second is the intermediate stratum within the establishment. These people are often the managers of state-owned capital and, at the same time, they’re often closely connected to large-scale private capital. By managers I mean both direct and indirect management, so these aren’t necessarily the general managers of state-owned enterprises; provincial party secretaries also play roles as indirect managers of state-owned capital. 闯: Is the only difference between these two groups their position in the political system? Are they connected to the same type of enterprises? LX: Not necessarily. For example, I feel certain that Jack Ma is directly working for some family of the state’s inner circle, whereas the heads of provinces or ministries control a different set of enterprises. The private enterprises they can control aren’t the most successful ones. Those are almost always gobbled up by the more powerful families, as far as I understand. 闯: And the third group? LX: The bottom rungs of the establishment and the smaller-scale capitalists. LX: Just say private capital. At least in form, it consists of independent private enterprises: they’re not controlled by state bureaucrats, they don’t belong to the state. Actually they’re not fully independent, but they’re further away from state power. 闯: How do those other interest groups you mentioned, such as lawyers, relate to these three categories? Do they all belong to the last one? LX: Not necessarily. For example the media, cultural circles, religious figures—many of them have various jibie (official rankings) within the establishment. You know jibie are important in China. 闯: So for example lawyers? LX: Actually most lawyers are outside of the establishment. But cultural figures, most of them with any influence—that is to say, those who are large-scale proprietors (大有产者)—they often have some status in the establishment, including a clear jibie such as “department-level rank” (正厅级) or “vice-ministerial rank” (副部级). 闯: So these interest groups belong to a different level of analysis than the three categories of rulers you just outlined? 闯: What are the main groups? You mentioned lawyers. 闯: What does that mean by “cultural figures”? You’ve said this can’t be translated as “intellectuals.” Can you give some examples? You mentioned university professors. LX: Actually religion could be included in culture, but it’s rather special, more closed off from the rest. 闯: You’re referring mainly to religious leaders? LX: Actually religion in China is completely independent from the state’s system of hierarchy, a set of independent organizations, especially Tibetan Buddhism and Islam, they’re like nations unto themselves. 闯: Are those all the special interest groups? LX: In China there are also a few small, disparate groups that also enjoy privilege, but they often overlap with the aforementioned groups, for example there are eight so-called “United Front Democratic Parties” as well as groups like the so-called “Patriotic Overseas Chinese Representatives,” which were the objects of pacification (统战) in the socialist era. Actually they’ve always enjoyed some degree of privilege, but now in the capitalist era they’ve converted that privilege into capital for use on the market. 闯: So the main groups with vested interests in today’s China are state bureaucrats as such, lawyers, cultural figures, religious figures, and these miscellaneous groups such as the United Front Democratic Parties. And then of course capitalists. But would you say that all these other groups also function as capitalists in some sense? LX: Yes, they’re all capitalists, but besides these groups there’s also a large group of people who function purely as the bosses of private enterprises and nothing else, not completely independent from the establishment but at a significant distance from it. And these are almost certainly all smaller-scale capitalists, because the larger-scale ones inevitably have close connections with state bureaucrats who share the profit, if the capital is not directly owned by bureaucrats’ family members. 闯: Alright, so now let’s get back to the contradiction you started to address last time between fractions of the ruling class regarding access to political power. LX: The contradiction is like this: For many years there have been these calls for democratization, but in fact the most direct expressions of this call have often come from the top, from the inner circle. Why is this? My analysis is that it is related to the desire by some members of the inner circle to complete the privatization of SOEs. They still want to privatize the best and strongest of China’s remaining SOEs. In a word, they want to fenjia: to split up the family’s property into multiple households. 闯: And Xi’s faction is attempting to silence these voices? LX: Chairman Xi completely negated these voices as soon as he assumed office, completely. You could say that at the top there was a protracted struggle between these factions, but no one would have guessed that Xi could have managed to negate the others so quickly. [The central SOEs] will not be privatized, and that’s the end of it. Chairman Xi depends on this strong state-owned capital to fund his projects. 闯: Often people assume the capitalism goes hand in hand with privatization, but you’re saying that Xi’s refusal to privatize the central SOEs is actually a measure to protect and strengthen Chinese capitalism, right? LX: It will support Chinese capitalism as a whole, making it stronger. And privatization would indeed weaken it. Those voices calling for privatization aren’t concerned about the long-term interests of Chinese capitalism as a whole, only about getting a slice of the pie for themselves to enjoy in the short term. LX: You could say repressing their political demands. But that’s not entirely correct. It’s been more of a trade-off: we prevent you from exercising any independent influence on state power, but in return we allow you to exploit workers more freely. 闯: Were private bosses not able to rely on the state to help them control workers in the past? LX: They were, but it was different. Before 2010, in the PRD anyway, there were a lot of strikes and the state didn’t intervene much, but that was mainly because the strikes were resolved quickly. For example, the workers would go on strike asking for a raise or something, and the boss would concede to their demands before the end of the day, saying “Ok, ok, here you go, now get back to work!” At that time, factories were really busy and there was stiff competition for orders, so it made a big difference even if production stopped for just an hour. Plus the pay was really low, so everyone knew it was reasonable to ask for a raise, and everyone knew the boss could afford it. It was a simple matter to agree to a small raise, as long as they went back to work before their orders were taken by some other factory. So it’s not that the state wouldn’t intervene, it’s that it would take too long to do that. It was also expensive and complicated, because the boss had to develop relationships with specific state officials, pay bribes, etc. Things changed after the economic crisis [of 2008], then there was the strike wave of 2010, and you know state policy relaxed for a couple years, but starting around 2013, workers’ demands started getting more complicated, taking longer to resolve, and the state started getting more deeply involved. It’s not just that it became more repressive. Its methods for dealing with workers become more sophisticated, involving the legal process, labor arbitration, courts and so on. You could say that since 2013, the state has stood more clearly on the bosses’ side, especially on key issues such as Social Insurance, or compensation for factory relocation. These involve large sums of cash, so the bosses aren’t willing to make concessions lightly. In these disputes it’s clear that the state helps the bosses to repress the workers. Or even when it comes to everyday things like overtime pay, when workers take it to arbitration, it’s obvious that the arbitrator takes the boss’s side…. 闯: Are there any other ways the state has attempted to integrate bourgeois groups outside the establishment over the past few years? How about through policy related to construction and real estate? LX: That’s hard to say, because there are so many different theories about that. But the main thing is that those entire sectors are already controlled by the state, and private real estate developers already have close ties with the bureaucracy, so there’s no need to try to integrate them or give them anything. Both individual bureaucrats and the state apparatus as a whole can already acquire a big share of the profit from those firms…. LX: This is how I would summarize the political situation over the past four years: Chairman Xi has begun to carry out state-building (建设国家). Prior to this, the Chinese government was like a protracted provisional government, from Deng’s market reforms all the way up until Chairman Hu stepped down [in 2012]. The task of state-building kept getting postponed. A sort of bourgeois state gradually came into being, but it was like the frame of a house: it had a roof, but there was no glass in the windows, and the interior wasn’t furnished at all. People could live inside, they could even invite some guests over, but…. If you say “incomplete bourgeois state,” that could be misunderstood as meaning the bourgeoisie hadn’t formed yet. It had formed, but especially on the spiritual level, its tentacles hadn’t yet penetrated deep into the minds of the people. It hadn’t yet established a complete set of rules and regulations for long-term planning. Chairman Xi is finally attempting to build a long-term state. In this sense, I think you could say that Chairman Xi is a founding father (国父). He’s trying to build something that could last for hundreds of years. 闯: What are some aspects of this state-building? You mentioned ideology. LX: Yes, it includes ideology. Also the final formatting of the role that the central SOEs will play. That has actually determined China’s future path. 闯: And then there are the attempts to deal with conflicts among bourgeois interest groups we were just discussing. LX: Yes. Also the repression of the lower tiers of society across the board. This includes their economic interests, political demands and independent social activities. 闯: And then there’s foreign policy. LX: Yes, or you could say “international strategy”: the protection of the rulers’ interests abroad…. I guess those are the [five] main aspects of bourgeois state-building that have been pushed to the front of the agenda since Xi assumed office. 闯: Let’s go back to the fourth one, the repression the lower strata. Could you give some examples? We’ve already discussed state intervention into labor disputes. What else? LX: Another would be the rejection of demands for social housing (公屋). That’s something that’s been discussed for years, but Chairman Xi has clearly removed it from the agenda. Because Hong Kong’s social housing has been somewhat successful in decreasing living expenses for the poor, and then Bo Xilai experimented with it in Chongqing. China already has a few state-subsidized rental properties throughout the country, but it hasn’t really been developed. Anyway Chairman Xi has said he doesn’t want to do it. This will especially hurt the interests of white-collar workers in the biggest cities, because housing is a big expense for them. 闯: How else have the lower strata been squeezed on the level of economic interests? LX: Social Insurance. I mentioned that a few years ago, shortly after Chairman Xi assumed office, some voice representing the central leadership said that “in the era of Hu Jintao, some unreasonable promises were made regarding Social Insurance,” meaning that Xi would decrease the state’s payouts. Basically this means a negation of the compromise that the Hu government made with the proletariat on the Social Insurance front. 闯: How has that played out in terms of policy changes? LX: So far, mainly in the raising of the retirement age. That much has already been decided. Of course at first they can’t just say they’re raising it by several years. They have to start by raising it a few months at a time, like “boiling a frog in warm water” (温水煮青蛙), gradually increasing it over time. I’m sure that by the time I turn sixty I won’t be able to get a pension. Also pensions are supposed to be increased every year or so to keep up with inflation, but that’s changing too: they won’t be increased as much or as often, so basically we’ll receive very little, just enough to keep from starving. 闯: How about nongmin (peasants or ruralites)? Has the Xi government put any new economic pressure on them? LX: Nongmin—that’s a tricky topic now. Nongmin in the strict sense [i.e. peasants] are increasingly limited to those who are too old, sick or disabled to move to the city or work for a wage. As for the rural population in general, their land is continuing to be taken away. This is another attack on the lower tiers of society. “The transfer of land” (土地流转). This is already being carried out across the nation. Now nongmin are left with nothing but an empty right to [their village’s collective] land [that they can’t actually use because it’s been transferred to some firm]. 闯: You also mentioned repression on the level of political demands. What’s an example of that? LX: The all-round repression of the bourgeois opposition (反对派) over the past few years. 闯: But now we’re talking about the lower tiers of society. LX: The lower strata don’t have any political demands. Anyone who cares about politics basically just goes along with bourgeois opposition. But they don’t take action, they just parrot the opposition’s words on the internet, venting their frustrations. 闯: So how does the repression of the bourgeois opposition affect the lower strata? LX: It automatically implies their repression by association (连带的压制), by a single stroke of the knife (一刀切). Because the lower strata don’t have the sort of resources that capitalists have. For example a boss can spout his nonsense in the Political Consultative Conference  or give a speech in those clubs of the private bourgeoisie…. 闯: And you also mentioned independent social activities? LX: Anything slightly inclined toward so-called “diversity politics” (多元政治) is likely to be repressed, such as those feminists, and also various NGOs…. But another “Chinese characteristic” is that [xiao]shimin groups are extremely depoliticized, so all kinds of activities concerning private life are not repressed at all. China is still far from a crisis of rule where the rulers would try to control everything. The rulers at the highest level are mainly concerned about holding onto state power rather than a more meticulous control over people’s private affairs. China is such an enormous nation with so many newly emerging social strata, it would be too complicated and time-consuming to try to control them all with any degree of sophistication. For now, that also works out for the rulers, because the people are busy enjoying their private lives, so there’s no need to assert strict control over them. 闯: So the attacks on independent social activities you mentioned concerns only those that are relatively politicized and have connections to entities outside of mainland China? LX: Yes, in those cases they’ll lock you up. This hasn’t affected society as a whole yet, but there is a trend toward repression. 闯: OK, now let’s talk about international strategy. Previously you mentioned that this actually started under the Hu government. LX: China’s state apparatus has always been rather powerful and its level of rule (统治水平) rather high. Many of these policies and strategies have been under consideration for many years. 闯: Even in the Mao era? LX: In the Mao era, China had no overseas capitalist interests, that’s a basic difference. The nature of interests was different. It was only after the 1980s that China’s overseas capitalist interests emerged. And then in the 2000s, after China joined the WTO, this issue rose to prominence. 闯: So in the 1990s there was discussion, but actions began to be taken only in the 2000s? 闯: But you said it already started under Hu, right? LX: Yes, Hu had to address this, because Chinese interests overseas were growing to be enormous, so they could no longer put up with losses…. But this is too complex to discuss today, we should set aside another time just to discuss this topic. 闯: Yes, we should. But could you summarize a few points about how things have changed since Xi assumed office? LX: Under Jiang and Hu, things were about the same, but as soon as Xi assumed office, it became clear that China would be expanding its business dealings in Central Asia, Southeast Asia and Africa. There’s an old term, “sphere of influence” (势力范围), or another, “the hegemony of the great powers” (列强的霸权). Now we can say that China is one of those “great powers.” In my writings I used to refer to China as “a new great power” (新强权). These all mean basically the same thing. 闯: When did China become a new great power? LX: It was hard to say for sure in the Hu era, but there were signs. Objectively, Chinese capital was pulling more weight in the world market. But at that time, China’s outward expression was to bury its head in doing business and not say anything if it suffered losses. It didn’t dare to say anything. This changed rapidly after Xi assumed office, in favor of directly asserting the overseas interests of Chinese capital through head-on confrontation. This was especially clear in a recent incident: Vietnam invited a Spanish energy company to drill for oil in the South China Sea, but China said, “No, you’re not allowed to drill here, this is our turf.” A week or so later, Vietnam told the company, “Sorry, let’s put this on hold for now, you have to leave.” China has already started this sort of head-on confrontation. Actually the construction of islands there is the most typical example. Basically it’s disrupted the balance of power between China and the US there. Last year I told you that the scramble for interests there and in the Pacific is as if China went over to America’s house and said, “Hey, your house is really big! I think I can live here too” (laughs). This is a serious change, because in the past it was as if all the seas in the world belonged to the US. 闯: Do you think China has already become a regional hegemon? LX: Between quantitative and qualitative change there is a tipping point. If you want to be on top, you have to make sure people are afraid of you, and that means you have to spill blood—that’s the most basic logic of the streets. No matter how developed your forces of production may be, if you want power you have to cause fear, terror. The whole world is afraid of America. 闯: So China hasn’t undergone this tipping point yet? 闯: Would you say China’s looking for an opportunity to fight on the border with India now? LX: China’s definitely looking for an opportunity, but India doesn’t want a serious conflict with China. This relates to domestic politics in India, this sensitive stage it’s in…. But it’s still possible there will be a war there, because China really doesn’t care who it goes to war with. Probably anyone other than the US would do, from Myanmar to Australia. But at the same time it’s important to China’s rulers that the conflict be as limited as possible, a war that will end quickly—just long enough to fulfill its function. So they need to choose an appropriate target and an appropriate excuse. Here you can see how high the level of China’s rulers is: they’re cautious and try to do things by the book, in stages, on the one hand strengthening forces along the border, while on the other talking to other countries according to international protocols, making official statements through the media, etc. It’s clearly being done according to a formula…. 闯: Would you say China has already become an imperialist country? LX: (Laughs) That’s the sort of question that leftists love to debate. It’s really a pointless discussion. It’s like debating “when does a boy become a man? At 18 or 20?” Then someone will point out some reason that a 30-year-old isn’t really a man yet. What we can say objectively is that China is a capitalist country with vast overseas territories, and that China’s rulers are undertaking serious measures to protect those territories. As for whether this is imperialism in Lenin’s sense, that requires more careful analysis. It’s not something that can be clarified in a few sentences…. In any case, China is building and protecting its own spheres of influence, and these are to be used by China’s rulers to acquire wealth through the capitalist market, rather than through direct plunder or tribute in the sense of pre-capitalist empires. 闯: You’ve said that this sort of international strategy and even war might benefit China’s subordinate strata in some ways. Could you elaborate on that? LX: It would be better to say that it will have complicated effects. Why say that Chairman Xi is carrying out state-building? Because some important elements of the bourgeois state, especially spiritual elements, still don’t exist in China. National identity, for example. 闯: Really? I’ve always felt that national identity was stronger among most Chinese people than almost anyone else I’ve met. LX: What you’re sensing is more of a pre-capitalist sort of identity. For example, typical Chinese parents take it as a source of pride if their daughter marries an American and becomes a US citizen, no longer pays taxes in China, and helps the US military develop guided missiles. They wouldn’t think that she’s betraying their nation. They don’t have the concept of a nation-state. They think being Chinese means you use chopsticks, you were born in China, you stick chunlian [couplets] on your doorway during Spring Festival. For the bourgeois state, that’s not enough. What does the bourgeois state require? An entire set of responsibilities to the nation-state, duties that aren’t open to discussion, a higher power. Chinese people don’t have this concept. As far as they’re concerned, China isn’t a nation-state, it’s just a place. In the Mao era there was a sort of socialist patriotism, but that sort of patriotism was linked to class identity and the idea that “what we’re protecting is a new society without exploitation.” They used the phrase “love of country” but actually what they loved was socialism. Later, during the era of that protracted provisional government, the sphere of patriotism became extremely awkward. Basically it was a void. Everyone was busy trying to make money by working or doing business. People have said that the Chinese have no morality, that they only care about making money for themselves. Really what that means is that China has yet to establish the comprehensive set of rules and customs associated with a bourgeois nation-state. For example, in the US if you violate some serious taboo, you’re ruined for life. Like those two African-Americans who won medals at the Olympics in 1968 and then did the Black Power solute during the award ceremony. What did the American rulers do to them? They didn’t punish them directly, they just left them hanging out to dry. Later neither of them could find good jobs, they just worked as common coaches, making regular wages. The US government didn’t directly persecute them because that would have turned them into martyrs. Instead it just made them watch as other star athletes grew rich and famous, while they were denied that…. China doesn’t have any rules like that. Deng Xiaoping’s famous statement, “It doesn’t matter what whether the cat is black or white, as long as it catches rats”—that epitomizes the extreme pragmatism during the era of China’s transition to capitalism. Nowadays that sort of pragmatism has become an obstacle that the state is trying to overcome. If China goes to war and things go smoothly, that would definitely stimulate true bourgeois patriotism among the Chinese people. (Actually all patriotism is essentially bourgeois, because it emerges only with capitalism and the bourgeois state….) If the war doesn’t go smoothly, that would cause a crisis of rule. 闯: You also mentioned some material benefits that ordinary Chinese people might obtain from the international expansion of Chinese capital—maybe not from war, but more generally? LX: That’s the sort of benefits enjoyed by ordinary people in other powerful countries. For example the way Westerners, no matter how poor they may be at home, can come to China and live pretty well just by teaching English. You could call this a dividend of imperialism. 闯: So now ordinary Chinese people can go teach Chinese in Cambodia. LX: Actually Cambodia is an interesting example, because there China has already established a certain… something like the status of white people in Africa, that kind of influence. But that’s still far from enough to benefit many ordinary Chinese people at this point. 闯: You said the effects of international expansion and war would be “complicated.” What would be the negative effects other than casualties? LX: It would stimulate social thought in China, and it’s hard to predict what that might lead to. Even if it’s expressed as patriotism, it might not necessarily benefit the ruling class. It’s safer for the rulers if society’s half-asleep. When a bunch of people who don’t care at all about politics suddenly become patriotic, they start thinking about politics, taking action, making demands—who knows where it will lead? A classic example is World War One, which mobilized tens of millions of Europeans. During the war, on the surface there were expressions of patriotism, but it politicized a lot of people, and when they went home many of them joined revolutionary movements in places like Germany…. So the Chinese ruling class is actually quite cautious about this. I know the foreign media often claim that the CCP whips up anti-Japanese sentiment, but actually it’s afraid of ordinary people going out onto the streets to protest, smash up Japanese businesses and so on. In this sense the Chinese government is really afraid of the masses. 闯: Then why are there so many movies and shows about the War of Resistance against Japan on Chinese television all the time? LX: (Laughs) When a tiny group of people rules a large number of people, ridiculous things often happen. Not everything they do is completely rational or consistent. But the Chinese government no longer dares to show anything related to reality on television, so it just pumps out hot air in cycles: for a while it’s ancient costume dramas, then it’s spy dramas, then it’s time travel, then its what they call “mythical dramas about the War of Resistance” (抗日神剧)—completely unrelated to historical reality, like mythology. The genre is just an absurd kind of soap opera. What this really reflects is the cultural desiccation of the ruling class. It can’t create anything with vitality. 闯: Have you seen Wolf Warrior II? LX: No, but I’ve watched previews and read reviews. It seems to be a typical cultural product of a bourgeoisie in an age of international expansion. Like Rudyard Kipling…. 闯: I’m sorry, I still don’t understand why you think the constant production and airing of films and shows about the War of Resistance doesn’t amount to a kind of nationalistic indoctrination. LX: In a more conventional bourgeois state, there are always some nationalistic or patriotic social organizations and movements that are directly fostered by the rulers, such as the white people’s militia movement in the US. China’s rulers neither foster nor allow anything like that. All that they foster is a sort of part-time, formalistic (值班性质) patriotism. They want a sort of national sentiment that stimulates ordinary people and creates an external enemy, but this stimulation is limited to these ridiculous dramas broadcast on TV. They would never go so far as to create mass movements, nationalist organizations, street actions—the Chinese government is afraid of all these things…. That sort of nationalism would not actually be aimed at attacking Japanese people [as a few are rumored to have been attacked during China’s anti-Japanese protests of 2012]. Historically these movements are mainly aimed at suppressing domestic resistance by the lower strata of society, attacking unions, left-wing students, etc. That’s what that sort of zealous nationalism is about: right-wing mass organizations, their members wearing military fatigues and learning to fight—the real target is rarely actual foreigners. The Chinese rulers would never foster that sort of mass movement because they’re afraid of any sort of mass action. As I’ve said before, Chairman Xi isn’t a typical Bonapartist. Bonapartism is when one section of the ruling class, expressed in the form of a dictator, uses the lowest strata of society, the poorest people, to attack a competing section of the ruling class. But Chairman Xi, you could say he’s attacking competing sections of the ruling class through his anti-corruption drive, but he’s consciously trying to avoid arousing the masses to rise up and support that drive through activities such as mass supervision [as Mao did, for example], or reporting cases of corruption to the authorities. And as I was just saying, China’s bourgeois opposition is the same way: for the many years of its existence, it’s done everything in its power to avoid a mass movement. It’s not even willing to mobilize the sort of small-scale opposition movement associated with white-collar workers and intermediate social strata. This is a big difference from the bourgeois oppositional movements in other countries, such as Korea in the 1980s, which succeeded because they were able to take advantage of mass movements. 闯: You say that Xi isn’t a Bonapartist, and you’ve said before that you find the term “populism” misleading. There’s been a lot of discussion about the idea that the economic crisis has given rise to a global wave of “populist,” often xenophobic mass movements with ties to right-wing politicians such as Trump, Modi or Putin, and some observers put Xi in the same category. Do you think this idea is useful at all? 闯: I agree that these phenomena are responding to economic crisis, that much is clear. Many of these other politicians could be described as Bonapartist to some degree or another. Actually Trump is the least so. Like Xi, he wouldn’t dare to truly incite the masses of ordinary right-wing patriots to go out onto the streets and take collective action. I’m talking about a true mass movement. What we’re observing now is just performance art. Americans are especially good at political performance, putting on a show. 闯: But a few days ago [August 12 in Charlottesville] they actually killed someone during one of these performances! LX: What does that count for? Everyone’s getting excited after one death—how does that compare with most capitalist countries? How many people have Modi’s followers killed? That’s what a more typical right-wing mass movement looks like…. I think the main difference is that America’s state apparatus is strong enough and its rule is sophisticated enough that it doesn’t need that sort of mass mobilization of the lower strata to help maintain order. Although there’s a crisis, it hasn’t gone that far yet. Modi is the most similar to classic Bonapartism that I know of. Putin is also more limited. Russian society is stuck in an extremely despondent condition, so again the rulers there don’t need to turn to the sort of violent mobilization we see in India, with thousands of people being killed. It’s true that the Russian rulers have many problems, and Putin has indeed adopted some of these elements—even more so than Trump—but the subordinate population there is so tamed that it’s not necessary to do much to keep them under control. And then Xi doesn’t need this sort of mobilization at all. 闯: So you agree that right-wing mass movements and something like Bonapartism has been spreading across the world, emerging in different countries to different degrees (with the least degree expressed in China so far), and that this is in response to the economic crisis and the lack of a left-wing movement offering a coherent response? It’s just the term “populism” that you object to? LX: Yes. In Chinese, mincuizhuyi [the term for populism] is a strange thing. If you’re talking to ordinary workers, it would be more helpful to say “exclusionary mass movements,” or even just “patriotic mass movements,” because I think this sort of politically-intentioned communication needs to change the ideas in people’s heads. You want ordinary workers participating in struggles to understand what patriotism really is. This isn’t a matter of personal preference but the political need to be wary of the mainstream uses of words. Mainstream media love to use the term “populism” in reference to any type of mass mobilization, such as people voicing discontent about the high cost of housing, the media calls that “an expression of populism.” Or if workers go on strike and the police come to repress them, and then the workers fight back, the media also calls that an expression of populism. So this term is really a vilification of mass action, as well as an obfuscation. It implies that “this mass action of yours is just the blind following the blind, causing problems for no good reason, it’s mindless”—that term is also popular recently, “mindless actions.” When we write, whether it’s a serious article or just something simple, we should do our best to express the essence of the subject matter. That’s why I say “patriotism” instead of “nationalism,” for example, because the mainstream often talks as if patriotism is good and nationalism is bad, but really they’re the same thing…. I also try to avoid talking about “the left” and “the right,” but basically what you’re saying is correct: the past few years have seen a global turn to the right in response to economic crisis, especially among young people from xiaoshimin families. This is also true in Hong Kong, where the right-wing turn of young xiaoshimin became clear in the Umbrella Movement. And it’s also true in many parts of Europe, where unemployment has been growing for so long, especially among young people. 闯: Would you say mainland China is still an exception to this trend? LX: China still doesn’t have any kind of bottom-up driving force—neither one against exploitation and oppression, nor one that attempts to obtain a false sense of security by more closely embracing traditional values. In the latter respect I think Hong Kong localism and the American movement around Trump are similar. But yeah, this sort of thing still doesn’t exist in mainland China. The main reason for that is economic: Chinese people are still busy trying to make money. Ordinary Chinese people can still feel as if it’s possible for them to make money. This is really different from most countries nowadays. An ordinary household can still work hard for ten or twenty years, save up a few hundred thousand yuan and buy a home, and the home will increase in value, and then they can even rent it out, so there still seem to be plenty of opportunities to make money. 闯: So in contrast with Bonapartist politicians like Modi, Putin or Trump, Xi isn’t connected to any bottom-up driving force responding to economic crisis? LX: If Chairman Xi feels any bottom-up pressure, it could only be a purely historical one. Chinese capitalism has already matured to the point that it’s in need of various adjustments: how to manage it, how to coordinate conflicts of interest, etc. But these are coming only from the top down. Lenin said that a crisis of rule occurs when the upper strata of society can’t continue to rule and the lower strata can’t continue to survive. In China, the lower strata are not yet having any serious problems continuing to live at least as well as their parents. Actually, in the PRD, for example, I do know that many workers are already beginning to feel that they can’t continue to live as they or their parents did before, but we’ve still got a long way to go before they start rebelling against the social order. They still think they just need to make some adjustments, like they need to get Social Insurance—that’s why this has been such a focus of struggles the past few years, but this sense of the need for change is only just beginning. On the other hand, the upper strata, especially the people at the very top, already do feel that they can’t continue to rule as they did before. I don’t mean the entire ruling class, it’s mainly the very top that feels this way, hence the conflicts within the class. The overwhelming majority believe there’s nothing wrong with how they’ve been living and ruling, so they’re discontent with Chairman Xi’s reforms, his crackdown on corruption and so on. The very top is always only a tiny minority, of course. Besides that, in China today there’s a vast body of lower-level rulers carrying out various functions, and most of these are resentful of Xi’s reforms to some degree or another. Of course they’re resentful—Chairman Xi’s strategy is precisely to expropriate many of these lower-level rulers. But this is being done in different degrees to different people, so some don’t mind it so much, whereas others feel it’s a catastrophe. LX: Yes, this is a typical splintering of the ruling strata, but it’s still far from reaching the point of open fragmentation, because everyone is still waiting to see what will happen. 闯: An opportunity for whom to do what exactly? For all the subordinate strata to rise up in various ways, or just for certain workers to carry out industrial actions? LX: In principle, it’s an opportunity for a mobilized or active working class, but such a class doesn’t exist yet, far from it. But I think that Chairman Xi isn’t a temporary phenomenon. He represents the beginning of an era—for China and perhaps for the world. So this sense of change and uncertainty (变动) is something that will last for a while. The ruling class won’t necessarily fragment, but it’s more likely to fragment now than before. 闯: How long do you think this era will last? Twenty years? LX: Probably longer. When an industrial nation of 1.4 billion people begins to establish a substantial system of top-down rule and achieve some degree of hegemony in the world, this is a historical era. Think about the Reagan Era, for example. You could say that started around 1980 and didn’t really end until the financial crisis of 2008. Although Reagan only served as president for eight years, as an individual he represented a whole historical trend and framework that started earlier and lasted much longer. LX: There’s definitely an opportunity. In Chinese we say “the wind and water flow in one direction for a while, and then they switch” (风水轮流转). Capitalist rule, after having undergone 25 years of unprecedented stability, is clearly beginning to waver (动摇). 闯: How could this opportunity be grasped, and by whom? LX: (Laughs) The proletariat’s revolutionary power is currently nil. LX: Yes, but I still believe that only industrial workers (产业工人) can lead a social revolution. 闯: But who does that category include, exactly? LX: Nowadays, for example, PhDs are completely different from PhDs forty years ago. Many people who have received higher education have already been incorporated into the circuits of social production (社会大生产). They’re completely unlike traditional intellectuals and more like industrial workers. There are still differences, but they’re similar, especially those tens of thousands of bioengineering researchers, for example, they’re just cogs in the industrial chain of production…. 闯: But only workers can be revolutionary subjects? LX: Yes. I don’t believe that peasants or, say, students or managers, could lead a communist revolution. 闯: How do you define “workers”? 闯: By their relation to social production. By who has the ability to influence it, who composes the agents (主体) of social production. In other words, without them, social production couldn’t continue. 闯: So not necessarily secondary sector (工业) workers, like manufacturing workers? LX: It definitely includes them. But also many others, such as computer programmers, laboratory researchers…. For example, a mechanic repairing machines in a casino appears to be exactly the same as a traditional worker, but actually he’s outside of social production. If he stopped working, it would have absolutely no effect on social production, and he doesn’t represent a serious group that carries any social weight. But if the same individual went to work as an electrician in a factory or a bioengineering lab, then his significance would change. 闯: How about service workers? LX: It depends on the service. For example, veterinary clinics for pets—that’s now a relatively big industry, but obviously its influence on social production is limited. That doesn’t mean that the tens of thousands of employees in that industry won’t get swept up in a revolutionary movement along with the rest of society—of course they will. But if they go on strike, that can only be supplementary to struggles at the core of social production, playing a supporting role. On the other hand, employees in supermarkets and restaurants, essentially what they produce is labor-power. They belong to the reproduction of labor-power. And then express delivery couriers, [although they’re labeled as “service”] actually they’re part of manufacturing, an extremely important part, because they lower the cost of production…. And then there are wenyuan [office workers]. 闯: So you consider them to be workers (工人) too? LX: Yes, for sure. It sounds strange in Chinese, but objectively, wenyuan are really just common work personnel (工作人员), and their social status is basically same as workers, just differentiated by a layer of ideological window-dressing. Many wenyuan in China haven’t been to university. But then some of them are bailing [literally “white-collar” but implying highly-educated and well-paid office workers]. Bailing status and incomes are higher…. 闯: Would you consider them workers too? LX: A simple categorization is by income. For example, if their salary is over 10,000 yuan per month, with bonuses they’ll make over 200,000 yuan per year, then they have plenty of extra money. They can use it to play the stock market, and they can buy a home and rent it out. That creates a distance between them and wage-laborers, because bailing also have a commercial income. And it’s common for them to play the stock market…. So I think the old term “petty bourgeois” is still appropriate here. Because they work for a company, but at the same time they also have a stable income from rent and stock market dividends. Or you could say they belong to a peripheral group (边缘群体) of intermediate strata between the working class and the bourgeoisie. But this is an enormous portion of the population. LX: Teachers underwent stratification long ago. In the past many teachers had bianzhi [permanent employment for a state employer]. Those were the good old days, especially in the wealthier parts of China. You could have a high income, or at least it was stable. But now they’ve all become contract employees…. University instructors have also undergone differentiation. For example, a lecturer may have an annual salary of 100 to 200 thousand yuan and no benefits, often they don’t even have social insurance. Often they can use their position in the educational industry to obtain some extra income on the side [through research grants, etc. ], or they can use their salary to play the stock market or buy a home and rent it out. Their status is also on the periphery [between the working class and the bourgeoisie]. Of course they absolutely do not consider themselves to be workers, but they’re still inclined toward a sense of social discontent. In the revolutionary movements of the 20th century, such peripheral groups underwent differentiation—it was hard to say which way they would go. Often it depended on personal factors. Between two medical doctors with the same position in society, one might end up supporting the workers and the other supporting the counterrevolution, depending on their experiences in life…. 闯: How about peasants (小农)? Do you think they’re mainly part of the proletariat now? Or would you say China no longer even has any peasants to speak of? LX: It’s too early to say that. The countryside still has people who can support themselves by farming their own land, and that’s a completely different mode of production. But these people no longer represent the countryside’s jinghua [young, healthy and somewhat educated] population. No one in their twenties or thirties would just stay there and farm their own land in a traditional way unless it’s a woman who’s husband works somewhere else while she raises their child…. 闯: Would you say people like that belong to the proletariat? LX: Most of the people living the countryside are in a sort of dissociated, unsettled (游离) condition. For example, they’ve been working in the PRD for fifteen years, but they still don’t have their own place to live here, their hukou [household registration] is still in the countryside, but they don’t have a sense of certainty about anything. That’s the overall trend, toward urbanization. They can no longer continue living in the countryside. Actually it’s not just the countryside: many workers in the PRD have purchased homes in towns or small cities near their villages, but they still don’t go back to live there. Why? Simply because they can’t find jobs there, or the pay is too low. They can make 4,000 yuan a month here, but there they can make only 2,000…. They’re shackled to the city. So you could say they’re part of the proletariat. Without a doubt it would be impossible for them return to peasant way of life under current conditions…. 闯: How about those who just run a tiny street stall by themselves and make less money than many wage-laborers? LX: That’s really not a sizeable or important sector of Chinese society nowadays, unlike in many Third World countries…. But small business owners more generally are indeed an enormous group. They’re also in a peripheral condition in relation to social production. These unsuccessful small business owners exist all over the world, even in America. Everyone wants to try to be a boss, but statistics show that over ninety percent of new businesses fail within the first two years. The only difference in China is that there’s also a huge population of industrial workers, and many of them also want to run small businesses, so they save up their wages for a few years and then spend it all in one go trying to start a business. They don’t necessarily fail—often they make a little money, but no more than they did as a worker, and they find that running the business is even more tiring, so eventually they give up and go back to work in a factory or something…. 闯: Let’s finish up by going back to my earlier question: this opportunity provided by the change and uncertainty of the Xi era—would you say it can be seized only through workers’ struggle in the sphere of production? LX: You could say that workers’ struggle must be at the core. 闯: Only the struggle of workers as workers against their bosses in their workplaces, rather than workers’ struggle outside the sphere of production, such as conflicts with the police? Because in the US, you know—and actually in China, too, only like thirty or forty percent of mass incidents are labor conflicts. Almost as many incidents are about land, housing, conflicts with the chengguan [police-like Urban Management agents] about the harassment of street vendors. And in the US, the most important struggles the past few years have been about police brutality. LX: None of these other types of conflict are capable of shaking the foundation of capitalism. On the other hand, judging by past experience, a revolutionary crisis is often sparked not by a struggle in the industrial sphere, but by something peripheral (外围) to it, such as a riot, a student protest, housewives trying to get bread for their families. But in each case, those struggles function only as a spark that ruptures the social order. After that, the only thing capable of ultimately changing the capitalist order, the leading force, is the organized industrial working class. At least that’s how I see it. 闯: Last question: Considering that workers in China don’t have any organization of their own, do you think any of the existing unions or NGOs could play a positive role in helping them to get organized? 闯: Well I know of some that say they’re doing preparatory work in order to support a revolutionary movement whenever one emerges. LX: “Preparing for revolution”! (laughs) That’s like a boy saying that he’s doing preparatory work in order to become a man. There’s no such thing as preparing for revolution, there’s only making revolution. 闯: You don’t think that before it breaks out there are some preparatory activities we should do? LX: The Communist Party has an unfortunate tradition known as the “Communist Youth League.” It divides young people into league members and party members, whereas in reality this process is indivisible. This division into a stage of preparation and a stage of finally doing something is limiting, including on the level of thought…. This is like the distinction between “economic” and “political” struggle—in reality they’re the same thing. Any strike could be a mini-revolution…. Any struggle, regardless of however limited its demands may be, contains some basic elements of revolution within it. It’s a negation of capitalist order and an awakening of the workers’ own power. In this sense, there’s no difference between preparation and finally doing something—as if you were preparing ingredients before you cook a dish. 闯: This sounds a bit like Rosa Luxemburg’s critique of Lenin, no? All the praxis of the 20th century was basically a continuation of 19th century social democracy. The left believed themselves to be professional political agents, among whom some believed themselves to be revolutionaries, while the workers were a separate group different from ourselves, whom we had to lead. The workers were to be led and liberated by us…. It was a disaster. 闯: So the main problem with today’s leftists is that they haven’t broken out of this pattern? LX: Yes. This goes for Maoists, Trotskyists—their ideas are one thing, but when it comes to practice, there’s no difference between the Trotskyists and the Communist parties…. To put it simply, the revolutionary praxis of the 20th century is bankrupt. I don’t mean that it failed—failure could mean that it was correct but it just wasn’t strong enough. I mean that the entire way of doing things was wrong. 闯: Then what’s the path forward for the 21st century? LX: I think that these historical forces might turn out to be an unexpected source of strength. That is, this utter bankruptcy could clear the path for a new social revolution. I don’t mean through so-called healthy forces or correct ideas replacing the mistaken and moving forward, but through letting all of this collapse, letting it completely fall apart. Today’s leftists are merely eating the corpses of the twentieth century. Even the corpses no longer remain, all that’s left are a few shards of bone, that’s what they’re eating. They’re still plodding away preparing for revolution in their secret reading groups—it’s completely pointless. 闯: So how could we break out of this dead end? LX: We need a mental breakthrough, a qualitative leap. But on the left there’s this ridiculous phenomenon: lots of self-proclaimed theorists are always inventing all kinds of theories, criticizing others and then inventing their own. This way of doing things is clearly a dead end. I should know—I’ve been one of these people! (laughs) After many years of fumbling around, my conclusion is that the only way out is workers’ struggle. I mean, you can’t just read books and invent a new way of thinking on your own, far away from workers’ struggles…. You have to go and directly take part in them. And at the same time we need to look back at records of historical struggles and revolutionary movements, not to simply negate the revolutionary practice of the 20th century, but just the opposite: to discover things that have been overlooked, the mass practices in past revolutionary movements that have been ignored. All along, the left has been obsessed with programs, parties, lines, etc., but I think we should focus more on mass struggles, in particular workers’ struggles: how they’re organized, how they subvert the capitalist order from the point of production, how they deal with the problems of self-management, how their antagonism with the entire capitalist state is expressed. This is one thing. The other is to go directly to places where workers’ struggles are concentrated and participate, but exactly how to participate is something we’ve been trying to figure out for several years, and only in the past year or two have we finally begun to make a little progress. Bo Xilai was party secretary of Chongqing and hero of many on China’s reformist Left (including much of the academic “New Left”) from 2007 until his high-profile arrest for corruption in 2012. On Bo and his “Chongqing Model” of governance, see “The Chongqing Model: What It Means to China Today” by Joseph Cheng in The Use of Mao and the Chongqing Model (edited by Joseph Cheng), City University of Hong Kong Press, 2015. That article is “非公有制经济领域意识形态工作问题及对策” by Zhu Xudong (朱继东), 红旗文稿, 2016/07. For an English source on the “Taishan Club” (the Taishan Industrial Research Institute, founded in 1994), see Chinese Politics in the Xi Jinping Era: Reassessing Collective Leadership by Cheng Li (Brookings Institution Press, 2016), pages 174-175. Here we did not get into political perspectives among the proletariat as such, but in the August 2017 interview below Lao Xie says that Chinese proletarians rarely have coherent political perspectives nowadays. When they do become politicized, they are more likely to adopt bourgeois positions such as liberalism, since those are the only coherent perspectives to which they are likely to be exposed. When we pointed to other Chinese proletarians we know with radical left perspectives, Lao Xie emphasized that these are marginal exceptions to the rule, and also that such perspectives are divorced from a social context that could turn them from “abstract radicalism” (see below) into something concrete or substantial. Another, younger Chinese Marxist we talked to made a similar but different analysis of the contemporary left. He also divided the left into reformists and revolutionaries, but he said each category tended to be aligned with another characteristic: reformists tended to be nationalists and revolutionaries tended to be internationalists. (By contrast, Lao Xie considers all nationalists – even Maoist ones – to be right-wing.) He said this distinction is far more important than those among factions within each of these two main camps, for example between Maoists and Trotskyists in the revolutionary/internationalist camp, and between Maoists and New Legalists in the reformist/nationalist camp. When the contemporary left emerged in the late 1990s (as Lao Xie recounts below), these two tendencies coexisted, often within the same individuals, and it was not until around 2012 that they became clearly articulated in opposition to one another. 2012 became a turning point because a number of factors came together that year, pushing leftists to choose a side, including: the anti-Japanese protests and riots, in which Han Deqiang (founder of Utopia, the most important “pan-left” website and bookstore since the early 2000s) slapped an elderly man in response to the latter’s criticism of the Mao placard Han was carrying; the arrest of Bo Xilai, who had become a hero for many leftists with a more reformist orientation; the formation of several labor activist groups and media collectives after many young leftists had become interested in direct action and “the new working class” following the strike wave of 2010; the rise of Xi Jinping, whom many nationalists embraced, to the disgust of even some leftists who had supported Bo (thus pushing them further away from the reformist camp). When asked, Lao Xie expressed agreement with the gist of this analysis and periodization. Xiaoshimin (小市民) literally means “small urbanites.” It is historically linked through translation to the European terms petit-bourgeois and Kleinbürger, which originally meant lower strata citizens of medieval self-governing towns, until these terms eventually settled into their present sense as lower tiers of the modern bourgeoisie. These two very different senses of these terms were translated into different Chinese words: xiaoshimin for the former and xiaozichanjieji for the latter. China never had a petit-bourgeoisie in the former sense, but the term xiaoshimin is now widely used to refer to lower-middle strata urbanites, with the term for “middle class” (中产阶级) generally referring to upper-middle strata. Different Chinese Marxists interpret these concepts in different ways, some using them interchangeably as referring to a fully-fledged class between the two major classes, others thinking of xiaoshimin as upper tiers of the urban proletariat and “middle class” as lower tiers of the urban bourgeoisie, for example. Lao Xie considers xiaoshimin to be an intermediate stratum between proletariat and bourgeoisie (rather than a fully-fledged class with its own coherent interests), whose individual members might end up siding with either of those two classes in the context of a social upheaval, depending on personal factors. By contrast, the Chinese term for “middle class” refers not to an objective reality but an ideal status everyone aspires to, linked to images of “middle class” lifestyles in Western countries. Even successful capitalists say they hope one day to become “middle class,” he says. See the end of the August interview below for more on LX’s critique of other left-wing perspectives and 20th century revolutionary thought in general. During the New Culture debates of the 1910s-1920s, this term “construction” or “constructive” was contrasted with “revolution” (革命), which was considered destructive, violent, etc. The famous liberal reformer Hu Shih famously mobilized the former term in a debate with Chen Duxiu (editor of New Youth magazine and eventual founding leader of the CCP), who did not shy away from the destructive aspects of revolution. Upon the CCP’s assumption of power in 1949, it began to frame its primary task as “socialist construction” until the idea of “continuing the revolution” rose to prominence in 1966, the two terms continuing to be juxtaposed in political debates up to the present. See “Che Guevara: Notes On The Play, Its Production, and Reception” by Huang Jisu (translated by Xie Fang), in Debating the Socialist Legacy and Capitalist Globalization in China (edited by Xueping Zhong and Ban Wang), New York: Palgrave Macmillan, 2014. This apparently refers not to the Sino-Soviet split in general (which started in the mid-1950s) but specifically to the border conflict of 1969—addressed in our article “Red Dust,” also in this volume. This description contrasts with our account in “Red Dust,” which shows that most of the first bureaucrats to go into profit-oriented business oriented toward both domestic and international markets were the rural officials in charge of township and village enterprises (TVEs) in the 1980s. Qiu He was party secretary of Suqian Prefecture, Jiangsu Province from 2001 to 2006, party secretary of Kunming (the capital of Yunnan Province) from 2006 to 2011, then deputy party secretary of Yunnan until his arrest for corruption in 2015. Chen Yun was one of the “Eight Elders” of the CCP and a main architect of China’s marketization in the 1980s and 1990s. On Bo’s “red culture” campaign and his popular representation as a sort of leftist social democrat, see Joseph Cheng (2015). Bo’s government forced developers to build subsidized housing for the poor, attempting to counter the nationwide trend of real estate speculation and rising prices for housing. For details, see Cheng, (2015), page 188. Lao Xie uses this term “democratization” in an unusual sense. As explained below, he actually means the formation of mechanisms whereby the party-state bureaucracy can share power with other fractions of the bourgeoisie and, on the surface, with other groups in a way that staves off rebellion by obtaining popular consent. Democracy (in its usual sense of electoral politics) would be one method for trying to achieve this, but it is clearly not the one preferred by the regime’s current leaders. An alternative being discussed in Chinese think tanks, according to Lao Xie, is Hong Kong’s current system of “functional constituencies” devised by the British colonial regime in the 1980s. In a later interview transcribed below, Lao Xie provides some clarification about this concept of “the cultural sector” or “cultural circles” (文化界) as a specific bourgeois interest group. In a broad sense it could include “the media” (often mentioned separately and apparently referring specifically to the news media) and “the religious sector” (宗教界), but in a narrow sense it refers primarily to the combination of (a) the entertainment industry (娱乐界) and (b) academia (学术界). When pressed, Lao Xie acknowledged that the people comprising all these sectors or “interest groups” are internally differentiated into bosses, workers and intermediate strata, but he regards them as generally functioning as coherent entities promoting the sectoral interests and ideologies of their bosses, such as religious leaders, influential film producers and the heads of major media companies. Even many lowly workers in these industries have internalized their sectoral ideologies. This contrasts with more purely commercial sectors such as textiles or logistics, where there is a clearer divide between bosses and workers and little distinction of interests or ideology from the basic profit motive shared by capitalists in general—and thus a less complicated conflict of interest with the party-state bureaucracy. See our account of the Wukan Village uprising in “Gleaning the Welfare Fields” and our interview with a participant in the first issue of Chuǎng. For a different analysis more closely related to Lao Xie’s comments here, see “Looking Back at Wukan: A Skirmish over the Rules of Rule” by Shannon Lee, <Wolfsmoke.wordpress.com/2017/07/14/wukan/>. Zhenghe Island was founded in 2011, the same year as the Wukan uprising. See “China’s business elite have their own private social network called Zhenghe Island” by Jake Watts, Qz.com, July 25, 2013. The significance of these closing fragments becomes clearer in the August interview below. Forbes ranked Wang Jianlin the richest person in China and the eighteenth richest person in the world in 2017, with a net worth of 31.3 billion USD. (Later Jack Ma overtook Wang to become the richest person in China.) Unlike Ma, Wang is more typical of private capitalists who emerged from the state bureaucracy, as well as being a “red engineer” by training. His father fought with the PLA during the Long March and became an officer. Wang Jianlin likewise served as a PLA officer in his youth, then as an official in the city government of Dalian, where he became manager of a state-owned residential development company in 1989 before becoming CEO of the privately-owned Wanda Group in 1992—now the biggest property developer in the world and owner of the world’s largest cinema chain (Wanda Cinemas), the US-based cinema chain AMC, the US-based media company Legendary Entertainment, etc. The Chinese People’s Political Consultative Conference (PCC) formally acts as an advisor to China’s official legislative body, the National People’s Congress (NPC), with branches down to the county level. Although the CCP holds two-thirds of the seats and vets the candidates for the remaining seats, it is presented as a mechanism for the “United Front” parties mentioned above and other important people outside the CCP to participate in legislation. This refers to the March 2015 criminal detention of the “Feminist Five” and subsequent related repression, addressed in several pieces on the Chuǎng blog, such as “Gender War & Social Stability in Xi’s China: Interview with a Friend of the Women’s Day Five” <http://chuangcn.org/2015/03/gender-war-social-stability-in-xis-china-interview-with-a-friend-of-the-womens-day-five-1st-half/> and “‘We should all be feminists?’ Repression, recuperation and China’s new women-only metro carriages” <http://chuangcn.org/2017/07/women-carriages/>. This refers to the Repsol incident. See “Drilling ship leaves Vietnam oil block after China row” by Matthew Tostevin, Reuters.com, August 13, 2017. Narendra Modi and his Hindu nationalist followers have been linked to multiple attacks on Muslims, most dramatically the 2002 Gujarat Pogrom, where 1,044 people died, 223 went missing and 2,500 were injured. Modi’s state government at the time has been blamed for inciting and facilitating the violence.